All children learn at different rates and the developmental range of what “normal” looks like is huge. But what should you do if your child is struggling with learning to read despite everyone’s best efforts? Go to the actual eye doctor, not just the pediatrician. Really investigate your child’s vision. When I was a K-4 teacher I knew of a child who struggled learning to read who turned out to be blind in one eye. If parental intuition tells you that your child might indeed have dyslexia, research your child’s rights to receive assessment through your local school district. However, understand that the IEP process is long and involved. If your child is performing close to grade level–even though they exhibit a multitude of dyslexia symptoms–the school district might not feel assessment is warranted. In that case, you might consider having your child privately assessed. Decoding Dyslexia will have more information about practitioners in your state who can assess your child. Expect to pay anywhere from $2,00-$5,000 for private assessment. You might feel ill-equipped to Afterschool for dyslexia, but the truth is that parents can help their child make tremendous progress with time, encouragement, and patience. I have a whole list of multisensory activities that teach reading right here, but they are not specifically designed for children with dyslexia. I think a better approach would be to sign your child up for a Nessy.com subscription, which only costs $10 a month. Read to your child every day, no matter what. Make books fun. Make they enjoyable! Convey to your child a true love of literature. Be clear that “ear reading” is every bit as acceptable as traditional reading. Finding out more information about your child does not change how smart they are, how much you love them, or forecast anything about their future. Information is only that: information. When you find out more details about how your child’s brain works, you’ll be able to better help your son or daughter learn to read. In the past two weeks, Jenna has made mind-blowing progress in her RUN, BUG, RUN! reader. I need to buy more star stickers! Most of these stories are at a Guided Reading level of A or B, but a few of them, like “Get the Moth, Meg” and “The Sad Hog,” are at level C or perhaps D.
I apologize for sounding like I’ve drunk the All About Learning Kool-aid, (full disclosure: I am an affiliate), but committing to our All About Spelling materials twenty minutes a day has really made a difference. As a former K-4 teacher, I’m still scratching my head about what’s going on. I’ve taught Jenna phonics since she was two years old. We’ve done multisensory lessons up the wazoo. (For a list of everything I’ve tried, click here.) All of my methods worked with Jenna…up to a point. Then she got glasses, which made a big difference. Now, my daughter is presenting me with the opportunity of becoming a better teacher. With my son Bruce, I could teach him a spelling pattern like “th,” “sh,” or “ch” and he could generalize that out to basically every word in existence. We could practice with 10 words, and he would be able to read 100. With Jenna, I’ve discovered I need to explicitly teach all 10o words. Not only that, but it makes a big difference how I teach the words. Flashcards are the least effective way for Jenna to learn new words. 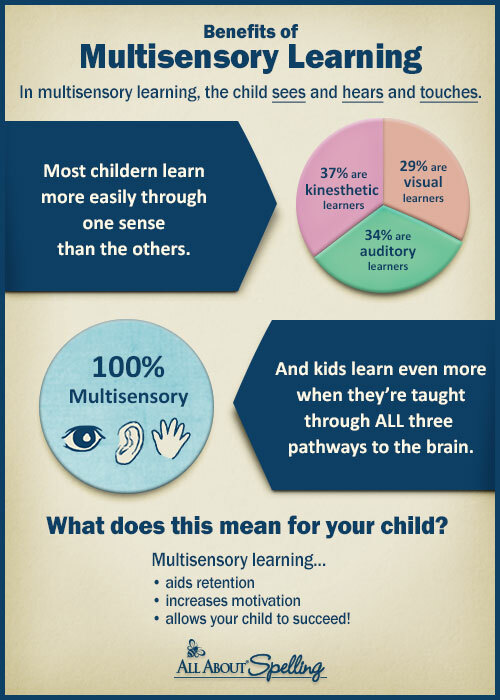 Multisensory activities are a lot better. Dictation helps too. She has exceptionally strong auditory skills, and can almost always sound out words properly–even though her handwriting is the subject of another post. In this picture, we are using raised lined paper and that helps a bit. Too many words doesn’t help. Jenna does better when she can learn words one at a time. Then, if you present her with text where she knows almost all the words, she will be successful. By the time Jenna has spelled out a word with tiles, and then written it down on paper, she does fine with the flash card version. When she encounters this word in text, she can sound it out. Another thing that is really helping is the reading focus cards. I’m not sure if reduces eye-strain, improves tracking or what. But for Jenna, they were really worth purchasing and a lot better than the homemade versions I had used with her previously. My homemade reading windows didn’t have colored film, plus the scalloped edges were probably distracting. For Jenna, they didn’t work very well, although I’ve had them work beautifully for other students. As a mom, I have 900 kid commitments I’m responsible for right now. As a writer I have a book coming out next year and a sequel following. As a newspaper columnist, I have a deadline every week. So unfortunately, tinkering with my blog is low on the list of my priorities. Ideally however, I should go back through all my old posts and tag them as “visual,” “auditory,” or “kinesthetic.” I would also go through my main list of ideas and organize them differently. I think Jenna would have had more success earlier if I could have pinpointed her best-practices-learning-path. “If your child is a visual learner, start here.” “If your child is an auditory learner, this page is for you.” etc. In the meantime, here’s a very cool visual from All About Learning. Last night my husband and I watched The Big Picture: Rethinking Dyslexia a documentary that digs deep into dyslexia. What is dyslexia? Does it go away? Are there advantages to having a dyslexic brain? How can teachers and parents help? Ever since that moment I’ve read everything I could about dyslexia, even now when I’m not longer a teacher. Many of the methods used to help dyslexic children are good ideas that can be used for all students. Be patient. Figure out what you are actually testing–reading speed or thinking? Teach kids how to take notes in a way that makes sense to each individual brain. Use technology to accentuate learning. Most importantly, empower kids to “own” their education. What I loved about The Big Picture: Rethinking Dyslexia is that it is inspiring. Big names like Charles Schwab and Sir Richard Branson share how the gifts of dyslexia have helped them in life. At the same time, all of the cast is upfront about the challenges they have had to overcome. The Big Picture: Rethinking Dyslexia is a movie all teachers should watch. Since 1 in 5 people have dyslexia, parents should absolutely see this film too. It all comes back to good teaching. There are a million ways to learn and the move paths to success we offer children, the faster they will succeed. Find a way to make words pop. Build words you can’t sound out. Use pictures and graphic organizers. Find fun ways to isolate words. Do hands on math whenever possible. Try to understand a child’s state of mind and how that effects behavior. Find ways to learn to spell besides copying words down endlessly. Seek out new tech like the Bookboard library. Recognize that there are so many ways to learn besides reading. Utilize special paper for dysgraphia. An abacus is your friend! My family visited Walt Disney World in December of 2014. I am gluten intolerant and allergic to soy, but do not have Celiac disease. Near the end of our vacation my son and I stopped for a quick breakfast at Sunshine Seasons in EPCOT. I knew that if I spoke up, somebody from the kitchen would bring out the big allergy book and figure out exactly what I could eat that was safe. However, we were in a rush, and frankly, I was sick of all the hassle. So I looked in the ready-made section and found this Antipasta salad that looked like it was okay. I paired it with coffee and an Enjoy Life bar, and paid for it with a quick service credit. Otherwise the total price was close to $17 as I recall. I took a big risk with the prosciutto because often times pork products contain gluten, but luckily I didn’t get sick. Any boy was that salad yummy! My family visited Walt Disney World in December of 2014. I am gluten intolerant and allergic to soy, but do not have Celiac disease. Everywhere we went at WDW I found safe places to eat. At Tokyo Dining at Epcot, the manager came to our table to help me choose things from the menu. My meal also included green tea ice cream for dessert. Everything was excellent! My family visited Walt Disney World in December of 2014. I am gluten intolerant and allergic to soy, but do not have Celiac disease. Everywhere we went at WDW I found safe places to eat. Cinderella’s Royal Table was no exception. The chef came to our table to personally go over the menu with me and offered lots of options. Fresh g-free bread and my own butter. I would whole heartedly recommend Cinderella’s Royal Table to the g-free guest. Please note, I made our reservations 180 days in advance in order to secure us a spot! My family visited Walt Disney World in December of 2014. I am gluten intolerant and allergic to soy, but do not have Celiac disease. The first table service restaurant we visited was Liberty Tavern in The Magic Kingdom. The chef came out to speak to me before I placed my order. This was my first encounter to how amazing WDW is at handling food issues. I ordered the gluten-free pilgrim’s platter with a cappuccino. It was outstanding! The chef whipped me up a special gluten free brownie alamode sundae for dessert, that I devoured before I thought to take a picture. You’ll just have to trust me on this one, it was pure heaven. I would definitely recommend The Liberty Tavern and hope to visit there again someday. For several years I’ve had something on my heart that I wanted to write but couldn’t put down on paper because it’s so hard to say. I finally did and it’s a guest post on “What to Expect.com”. They’ve also shared it on their Facebook Page. What to Expect When You’re Expecting was my go-to book for all of my pregnancies. So it means a lot to me that you can go onto “What to Expect.com”, type in the word miscarriage, and find my story. It means a lot to read all of the comments and responses to my article. I hope in some small way I am able to help. P.S. If you are new my blog, please click here to find out what Teaching My Baby to Read is all about. My “I Brake for Moms” column from the Sunday Herald.